If you run a nonprofit, you’re probably already familiar with #GivingTuesday. #GivingTuesday is a national day of giving that’s celebrated each year on the first Tuesday after Thanksgiving. 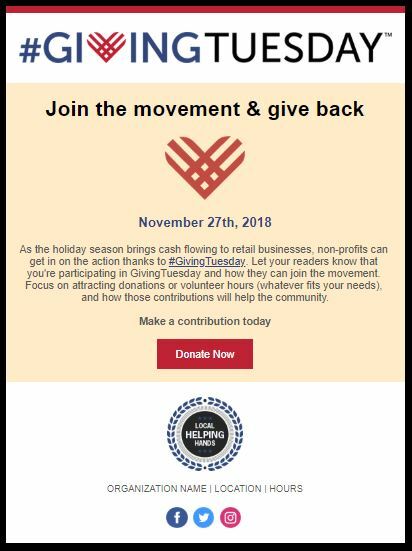 #GivingTuesday is similar to days like Black Friday, Small Business Saturday, and Cyber Monday, except rather than shopping at their favorite businesses, people have the chance to make donations to the organizations and causes that are important to them. In the past, online giving on #GivingTuesday nearly doubled year-over-year. And this year, #GivingTuesday is expected to be even bigger! If you’ve already started promoting for #GivingTuesday, now is a great time to finish up strong. Even if you haven’t, you still have time to get your organization ready and take advantage of this important day of giving. We have the tools to help your organization reach its fundraising goals on #GivingTuesday and throughout the holiday season. 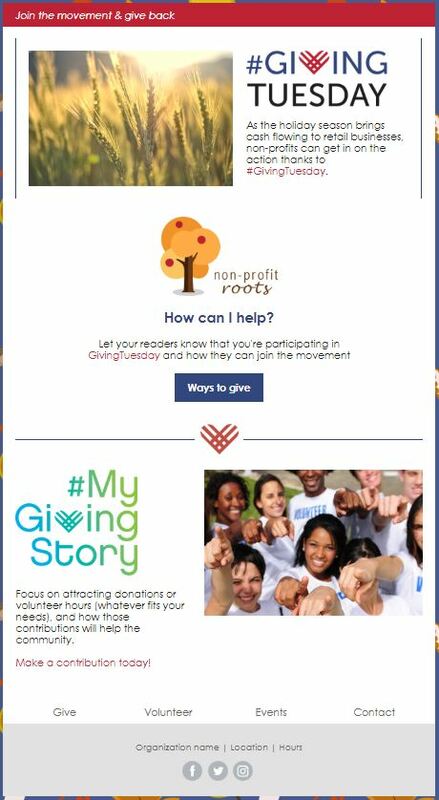 With our #GivingTuesday email templates, we are making it easier than ever to reach out to potential donors and encourage them to participate. We also have other professionally-designed templates you can use to support your fundraising efforts throughout the rest of the year. In addition to our holiday templates, we’ve also created a guide to show you how to end your 2018 fundraising on a high note, and extend your success into the New Year. Finally, we’ve compiled some of our favorite resources for busy nonprofits. We’ve also reached out to nonprofit experts to get their best tips for end-of-year fundraising. Check out all of the tips in the presentation below!